Great review. Such a classic and an item that will go with so many things that will carry you through the day. Wow, looks like the perfect bag for the daily grind and even after hours too. I really love this. It would be something you could use all year long. Really loved the post today. What a wonderful designer. Oh that bag is cute and totally you! I love across-body bags, they are my new fave! That is such a beautiful bag. Rebecca Minkoff's bags are always really gorgeous. Sounds like an awesome bag! I've been thinking about buying this bag. Wonderful review! And I love the studs! So perfectly rock and roll! I LOVE Rebecca Minkoff - my grape Nikki is one of my most prized possessions! LOVE this clutch! Must get my hands on one! that bag really is fantastic. I'm usually not a fan of Minkoff in the first place, so this bag doesn't really appeal to me. I find that for the quality of her bags, she could make the designs look less cheap. But it's good to hear the faux leather at least does not feel like it. i'm definitely a fan of a black bag with studs. and i knew you would love this bag because you are such a big fan of Rebecca Minkoff! it looks great. Interesting. I think it's pretty cute. Mabye not for ME exactly, but I'm sure some of my friends would love it. That bag is so amazing! Love the studs on it! That bag is gorgeous! I'm amazed at the price. I'm glad you like it! She really has the pulse of the Downtown feisty girl - I love it! Oh this bag sounds like absolutely perfection! OOoooh I love it. Such a chic design. i really like it too, subtle sophistication with the hint of edginess. The perfect blend. And 60 dollars is not bad at all. It seems to me like a fabulous bag! I love the studds and that kinda glam rock feel! It looks wonderful! 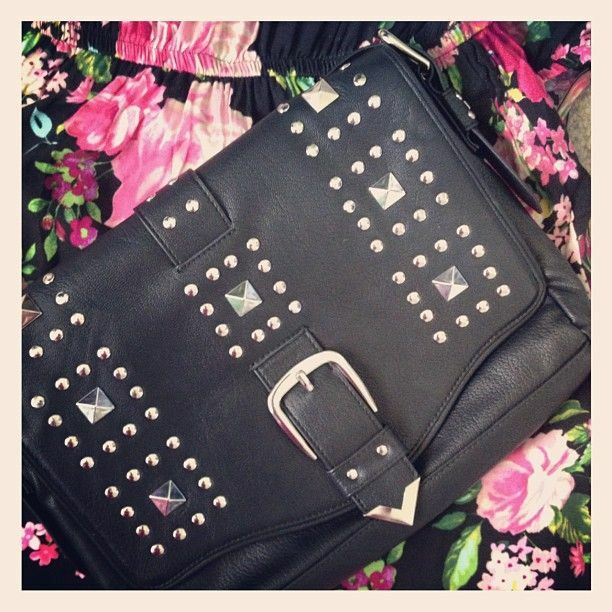 I love the studs on it, really cool! very nice collection. very nice dress. very nice bag and i love black color bag.